Here we document cases of Cartierism: rediscovery by western medicine of pre-existing remedies and treatments. Cartierism can be used to describe incidents of where the medical industry has taken information about a medical treatment without proper attribution, oftentimes from indigenous medicine resulting in cultural appropriation. Cartierism also describes cultural ignorance of efforts to discover alternate remedies while no effort is put into implementing an existing remedy. In the the 13th century crusaders contracted scurvy sometimes during lent and blamed the eel they ate at the time instead of meat. Despite being the middle east, onions had been lost from institutional memory as a cure. 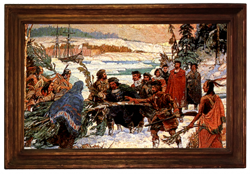 In 1535, a French explorer named Jacques Cartier learned of a remedy for scurvy from the Native Americans of lower Canada, which was prepared by extracting the needles of pine trees with hot water. The first English reference to the disease occurred in the Oxford English Dictionary in 1565. In 1911 there was an "infantile scurvy epidemic when middle class mothers, afraid of the recent discovery of Listeria bacteria in milk, began heating it to kill the germ. This denatured the ascorbate and a million babies died of scurvy. Once that was discovered fruit juice was substituted which some say was the origin for the obesity crisis. So scurvy comes and goes. Our diet is generally okay and has enough daily leafy greens in it so it�s not something most people have to worry about. But it's not most people that are dying of trivial diseases such as flu. These are the people with inadequate diets, in every case. So, people still die of scurvy. A healthy immune system - and there's no contest whatsoever that C is the most important molecule in the entire immune system, will prevent that. People that pay attention to this will never die of a silly deficiency disease as a result of an infection that followed an attack of the flu virus. By 1990, 20% of admissions to London hospital for schizophrenia were scurvy.